Your dad (or mom) calls and tells you he is feeling weak. He may have had either a recent cold or "viral bug" accompanied by nausea, vomiting, or diarrhea, or some combination of the three. He hasn't had much of an appetite over the last several days, yet he has still taken all of his medications faithfully. He may have diabetes, hypertension, heart disease, or congestive heart failure, all of which are very common conditions in the older population. Regarding his medications, he has been taking an ACE inhibitor and is also on a diuretic, such as furosemide (Lasix). He may also have significant arthritis, and despite his doctor's warnings he has been taking ibuprofen, more so when the weather changes and he notices his arthritis acting up more. Concerned, you visit and notice that he is very weak and debilitated. You call 911 or take him to the hospital yourself. You're now in the emergency room of your local hospital. Your dad had some blood work done, and the next thing you know you are being told by the emergency room doctor that his "kidneys are bad" and that a kidney doctor will be coming. There may be other abnormalities in his blood work, too, including abnormal sodium and potassium levels. You are in shock by the news because your dad has never had a kidney problem that you were aware of. The severity of the illness. 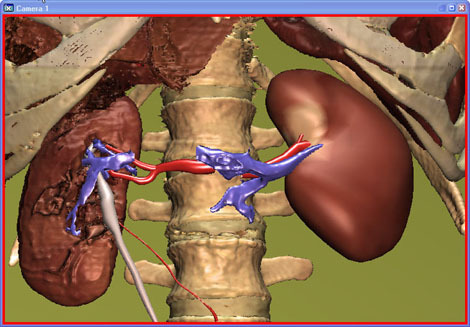 The kidneys are in harmony with the rest of the body and will be affected by a severe illness. It is common to see the kidney function affected by a bad illness, especially in people who are admitted to the hospital. The degree of kidney disease present. Often, doctors will find that there was some degree of CKD present that no one ever knew about. The less kidney "reserve" one has, the less able the kidneys are to fully recover from significant body stressors like an acute illness. The medications that interfere with the kidneys" built-in defense mechanisms. Some medications get in the way of the kidneys' defense mechanisms as they try to maintain normal function in the face of a bad illness. Let's review the effects of some of the medications that interfere with the kidneys. These classes of medication are effective in treating heart and kidney disease over a long-term basis. In this acute situation, however, when the body is not in its normal state, relaxing the kidney can actually make the kidney function worse. If your doctor is going to put you on one of these medications, understand that if you have an acute illness, nausea, vomiting, or diarrhea, you should not take it until those symptoms resolve. Your doctor will likely check your blood work to closely monitor your kidney function. Many older patients may have a history of congestive heart failure or have significant problems with edema. From personal experience, I can tell you that many of them are deathly afraid of stopping their diuretic for fear of fluid building up in their lungs or legs, and the necessity of possibly having to go into the hospital. Yet when they have nausea, vomiting, and diarrhea, and are eating and drinking less, they can make themselves really dehydrated if they continue to take their diuretic. This can dramatically worsen their kidney function. To find out more, you can check out Chronic Kidney Failure Symptoms.